History makers on the penultimate day in Shenzhen with Lin Gaoyuan and Chen Xingtong winning the first Mixed Doubles title on the ITTF World Tour, one day later China has completed the trophy clean sweep at the Seamaster 2018 ITTF World Tour Platinum Kaisa China Open after emerging victorious in all four of the remaining title contests on Sunday 3rd June. Revisit all of the action from the final day of play in Shenzhen with our review. 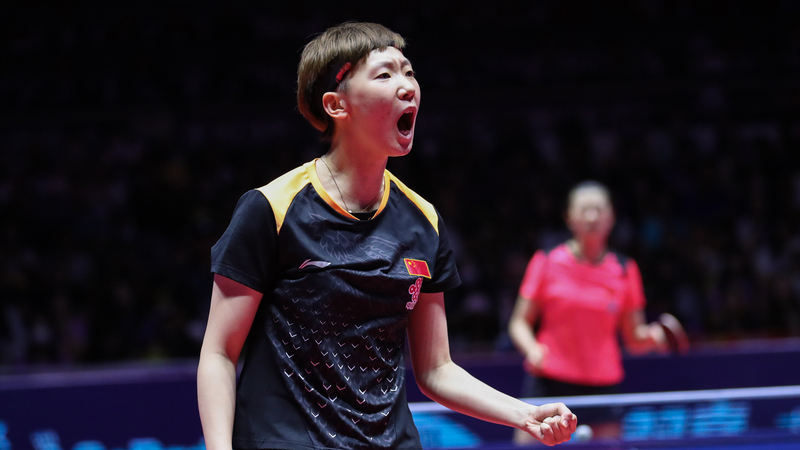 Celebrations for the home fans began right from the off with Ding Ning and Zhu Yuling picking up China’s first title of the day with a successful outing in the Women’s Doubles final. 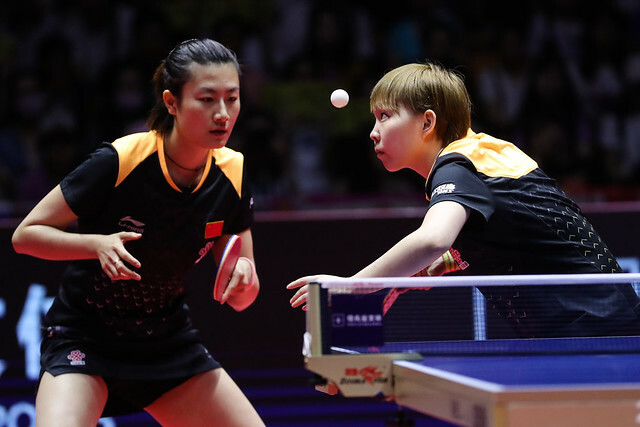 Seeded fifth, the partnership of Ding Ning and Zhu Yuling required just the four games to see off third seeds Jeon Jihee and Yang Haeun (11-9, 11-5, 4-11, 11-5) to win their third gold medal as a pairing on the ITTF World Tour while their opponents from Korea Republic settled for a runner up finish for the ninth occasion. Outstanding in the penultimate round of the Men’s Doubles event, but in the final the Romanian and Spanish duo of Ovidiu Ionescu and Alvaro Robles weren’t able to replicate the dramatic scenes of their previous round victory over World Champions Ma Long and Xu Xin as they lost out to top seeds Fan Zhendong and Lin Gaoyuan in the race for the top step of the podium. Seen off in straight games (11-9, 11-4, 11-4) but Ionescu and Robles can be proud of their efforts and will forever look back at their time as a team in Shenzhen with fond memories. Then came the first of two long-awaited encounters as Wang Manyu met Ding Ning in the highly anticipated Women’s Singles gold medal match. Victorious last week in Hong Kong, fourth seed Wang Manyu held the slight edge against No.9 seed Ding Ning in a dramatic seven games battle (13-11, 9-11, 9-11, 11-9, 11-8, 9-11, 11-5) to win her third Women’s Singles title of the year and prevent her opponent from winning the crown for the third consecutive year in China. The concluding contest of the day came in the Men’s Singles tournament with Fan Zhendong and Ma Long taking to the table in a spectacular demonstration or world class table tennis action. Spectators were treated to a match full of wonderful moments with both players showcasing why they deserved their spot in the final but only one could come away with the trophy and that proved to be fifth seed Ma Long. Falling behind to Fan Zhendong early in the tie but Ma Long went on to recover four games in a row against the No.1 seed including a dramatic win in game five to seal his sixth title in the category at the China Open (7-11, 11-8, 11-4, 11-3, 14-12).